Rick Warren, bestselling author of the "Purpose Driven" Series and pupil of televangelist Robert Shuller has announced his "Global Peace Plan" to turn this planet into a "Purpose Driven Planet". Using a deceptive theology, he plans to make a global network of one billion people in order to establish the "Kingdom of God". And George W. Bush gives his blessings! April, 2005. The "Angel Stadium" in Anaheim, California, United States of America. A crowd of 30,000 people gather themselves in order to celebrate the fact that 25 years before, a man called Rick Warren started a church. He had just learned how to do such a thing by attending Robert Shuller's "Institute of Church Growth". Rick Warren is the leader of Saddleback Community Bible Church. He started in March, 1980 by doing so-called "trial run services" in which he layed down a so-called "vision", his plan. Quite an ambitious young man he was, as he layed down his plan to "send out hundreds of carreer missionaries and church leaders" and to "build daughter churches" all over the world. And his own church? Rick Warren revealed his vision about a church "set in a peaceful inspiring garden landscape with bright flowers and beautiful trees and pools of water, sparkling fountains, and flowing streams". A little Garden of Eden? It most certainly looks like it. It's a fact that many look on Rick Warren's church as if it were some kind of role model. Not in the least, because Rick Warren himself presents his church as this role model. The keyword is "Purpose Driven". And it has become a huge industry. Now that is quite an attendance. The president of the USA, along with Billy Graham and some of the hottest stars in the Christian Music Industry all have some reason for a little celebration. And a celebration it was. Twenty-five years after Rick Warren started his church it was time to gather all the members and initiate them into the next step of his vision. A local Garden of Eden is nice, but what about a Global PEACE Plan? Suddenly, it becomes more clear as to what is happenning in the Purpose Driven Movement. Discerning Christians have allready established how Rick Warren's bestselling books and Church Transformation Programs were literally jam-packed with New Age teachings and other false doctrines. Writers such as Warren Smith in his outstanding book Deceived On Purpose have pointed out how the Purpose Driven Movement makes use of New Age keywords and introduces a New Age mindset to the Christian church. Yes, Rick Warren has a Global PEACE plan. He also calls it a "new reformation". But when you take a closer look into his plan, you are reading the New Age blueprint. In a speech which is released on the Internet in both audio and transcript, Rick Warren lays out his vision once again. Please download the files for verification of the CRC statements given below. Throughout the whole world, churches of all denominations have "gone Purpose Driven". Rick Warren calls his Purpose Driven Movement a "New Reformation". Indeed, it is. And to Rick Warren this is a normal thing. After all, there is no basic difference between a church and the entertainment industry. "The point I want to make is this, everything manmade has a shelf life. It doesn't last. Good medicine loses its potency. Good food loses its flavor. Good businesses lose their vision. Good organizations lose their effectiveness"
But does this same apply to the Church of Jesus Christ? "The Bible points this out. In fact, in Hebrews 8:13 it says, "When anything grows weak and out of date it is obviously soon going to be dispensed with." You can see the evidence of that truth from the Bible in every area of our society and our world. You can see it in politics. You can see it in business. You can see it in denominations. You can see it in entertainment. You can see it in art and science and music." Warren explains his theory of various ages in which the old has to be replaced with the new or rather transformed to use a classic New Age keyword, with all kinds of Bible Scriptures. He calls it a "truth from the Bible". And he applies it to the Church as well as every other "area of our society and our world". This is important to notice. For the "Church" where Rick Warren speaks about, truly is a part of "society" and "the world". Warren speaks about the man-made organization which is mistakenly called "Christianity". It's the sum of all denominations, the Churchical System with it's origin in the apostate Church of Rome, later to become the Roman Catholic Church. It is this Church System, which continually reforms itself along with the Zeitgeist (Literally: Time spirit). It is this Church System, which Rick Warren identifies himself with. It is this Church System, of which he states it needs a "New Reformation". "I see it. God is doing some exciting and new things in this world. You can see it everywhere. I get stories literally everyday from all around the world about what God is doing in the world. Jesus said, "I make all things new." He is a God of newness. But Jesus also said, "You can't put new wine in old wineskins. They will burst the skins. New wine must be poured into new wineskins." (...) I began to ask, "What are the new wineskins that you are creating for the 21st century?" The message must never change. But the methods have to change with each generation." The new wine which Jesus Christ speaks of, is the very same Message of which Rick Warren says it "must never change". But still he applies a bible scripture about the Message, the Gospel of Jesus Christ, to his "New Reformation". Jesus indeed speak about "New Wine". He was speaking about the fact that before His comming, people only had the Old Testament Law which could never give them eternal life. Now, with the comming of Jesus Christ about 2000 years ago, truly something new has come because it is no longer through the Old Testament law, but through the Grace of God through Jesus Christ that one can get peace with the Creator. There is no way that one can apply these scriptures about the New Wine of Grace through Jesus Christ in order to justify some theory that God has New Wine for each man made century. There is no way in which God presents a Church in the New Testament which continually has to renew itself, either. All of this is nonsense to Rick Warren. He despises doctrine. He thinks that doctrine is a minor issue. And so, he claims how the church has to go through reformations again and again. A New Reformation, a Transformation, a Global PEACE Plan. The Purpose Driven Church, the Purpose Driven Life, and even: the Purpose Driven Nation! The new reformation that Rick Warren speaks about, turns out to be nothing less but -indeed- a Global PEACE Plan in which the Christian Church establishes a New World Order, called the Kingdom of God. When the Plan is fullfilled, Jesus Christ will come back to rule over this kingdom. Closer reading of the material Rick Warren put out reveals how he plans to use his network of Purpose Driven Churches to build Purpose Driven Nations in which there is a fusion of State, Church and Business. This shouldn't come as a surprise for those who are a little bit familiar with Rick Warren's educational background. Not only did he loyally attend Robert Shuller's Institute for Church Growth, he was also mentored by Peter Drucker. "Peter Drucker, the management expert, father of modern management once said to me, "One of the reasons that the church has lasted 2,000 years is because the Holy Spirit has given it the power to renew itself." We have Easter every Sunday." Is the Church lasting for 2000 years because of some "power to renew itself"? Hardly. Jesus Christ clearly said that He builds His Church and the gates of hell shall not prevail over her, not "it". We also see this idea of a continuous reforming and transforming reflected in the mind sets of Christrians who are influenced by the Purpose Driven Paradigm. Should it be a surprise to find out how Rick Warren is heavily influenced by major players in the New Age Movement? Should it be a suprise to find out how Peter Drucker was a major influence in Rick Warren's Purpose Driven Paradigm? Indeed, the father of modern management, or better: New Age Management. In the 1980's, 1990's, Peter Drucker has fused business with the state and made quite a name for himself. An Internet search for him will reveal just that. It has been said, how his next target would be to fuse the church and business. Mussolini's definition of fascism was, "a state in which government and business fused". To fuse church and commerce is described in the Bible many times. For example, when Jesus whipped the merchandizers out of the Temple. The bible also reveals how in the last days there will be many false teachers who will, according to the apostle Peter "make merchandize out of the believers". And indeed, we know from the Bible how there is a Global PEACE Plan. The Bible calls it "the mystery of iniquity", or "Mystery Babylon". We know that in the 1800's the theosophical movement was founded by one Mme Blavatsky who wrote the book "The Secret Doctrine". In this book, which was dictated by a demon spirit, she layed down Lucifer's PLAN to bring back the "Days of Atlantis", or in Biblical terms: "The Days of Noah". Is it a coincidence that Rick Warren's Global Peace PLAN happens to be in total contradiction with Biblical Prophesy but perfectly fits in that New Age Programm simply called: THE PLAN? Mme Blavatsky founded the Lucifer Publishing Company. Later, that name was changed into "Lucis Trust". What the Bible is for Christianity, Mme Blavatsky's book "The Secret Doctrine" is for the New Age. The New Agers speak about the comming Messiah, the Maitreya. He will be the comming World Teacher, who will bring Global Peace. He will usher in a New Age where mankind will "know themselves", which in the mind set of the Luciferians means as much as "proclaiming ourselves to be God". As the Christians have the "Lord's Prayer", in which the Christians pray for the Kingdom of God to come, for the Will of God to be done on earth as well as in heaven, so do the New Agers have the "Great Invocation" in which they pray for the Antichrist or Lucifer to come. The above is a standard New Age Prayer to speeden the comming of the Antichrist or Lucifer as published by Lucis Trust, formerly Lucifer Publishing. Lucis Trust and the other New Agers will be pleased with Rick Warren's Plan. They will recognize it as their own. Because it is their own! Deception doesn't come blatant. Otherwise it would not be deception. But the scenario layed down in the Great Invocation of the Luciferians is the very same scenarion as the one Rick Warren puts forth. Take Purpose Driven People (Let purpose guide the little wills of men), and let them work to "Restore the PLAN on Earth", which will bring about the Return of Christ on Earth. Whether they know it or not, people who will participate in Rick Warren's PLAN will end worshipping the Antichrist. After all, "pastor Rick" Warren told them how Jesus Christ would come at the end of his "New Reformation". According to Rick Warren, the New Reformation which will also bring about Global PEACE will result in the comming of Jesus Christ. Where the Bible clearly reveals how God will Personally put an end to the wickedness and suffering, how wickedness and injustice will only increase until that time, Rick Warren teaches the opposite. "I believe with all my heart it's going to involve the errradication of global giants. That means elimination - erradication, obliteration of the global giants - of things the world has put up with for thousands of years"
Rick Warren keeps speaking about five "Global Giants". He truly has a spiritually very unhealty obsession with dates and numbers, but that aside. These giants are all kinds of world problems and Rick Warren says that they have to be knocked down by the Church. He claims, how Jesus Christ will only return after the world's problems are solved by his network of Purpose Driven Churches. "Then I believe the second reformation will not only be the mobilization of Christians and the multiplication of churches and the erradication of global giants and the cooperation between congregations but the evangelization of the planet. Jesus said, “This Gospel shall be preached into all the world to every nation and then the end shall come.” He’s not coming back until that happens." Does the Bible prophesy that the Church will take over the world and bring Global PEACE after which Jesus Christ will come again? Rick Warren doesn't just say that the Gospel has to be preached before the Lord Jesus will return, even though it seems like that. What he would call "world evangelization" takes place as a part of his Global PEACE Plan! The Bible clearly says, that there will only be Global Peace after Jesus Christ returns! At His return, HE will destroy the "five Giants". The Church of Jesus Christ is not called to conquer the world for some Christian New World Order, the Church of Jesus Christ is called to hold on to the faith! "Habakkuk says, "For the time will come when all the earth will be filled as waters fill the sea with an awareness of the glory of God." That's the goal of the second reformation." "Let me tell you what our goal is here in Purpose Driven. Our goal is 10 million churches with a hundred million small groups mobilizing a billion disciples for the global glory of God. That's expoential thinking. That is through the multiplication of churches, the mobilization of Christians, and the evangelization of the world so there would be the eradication of global giants through the cooperation of millions and millions of churches." "So the critical question is, "Will we move forward into the Promised Land or will we die in the wilderness?" These problems we've talked about all week, they're not new. But how we're going to do them will be new. Church to church, group to group through the global P.E.A.C.E. plan"
But it gets worse, when we find out just how Rick Warren wants to bring about this Global Peace. We have allready seen how he sees the church as a part of society and how (therefore) he applies Bible sciptures about the Church and the Christians to about everything. We have seen how he gets his teachings from Peter Drucker who is one of the leading forces behind globalization and privatization. We will now see, what it means for a Purpose Driven Church to be a part of the Global Network for the Rick Warren's Global PEACE Plan. In the second half of his two-part lecture on the "New Reformation", Rick Warren goes deeper into his plan as well as in the expectations he has. It turns out, that complete nations will have to be transformed into "Purpose Driven Nations", starting in Africa! "We call this the catalytic transformation model. Just like we talked about every individual going around the diamond from first base to second base to third base to fourth base, we believe churches can do the same thing. We use four words: adopt, become, contribute, and deploy." "Your goal is to get to the first base. To go back and say, “Our church is going to adopt the paradigm, adopt the strategy. We’re going to become a Purpose Driven church, building on God’s purposes, not personality, not programs, not tradition, not events, not finances. We’re going to build on the purposes of God.” Some of you are at that first step. You need to adopt the paradigm. You need to adopt the principles and say, “We will build on the five eternal purposes of God.”"
Rick Warren needs a lot of churches for his Global PEACE Plan. We have seen how he speaks about "10 million churches with a hundred million small groups mobilizing a billion disciples". And now he's explaining how these 10 million churches, from all denominations, will be united into one Network. A network of Purpose Driven Churches, who have all gone through a catalytic transformation starting by adopting the Purpose Driven Paradigm. Throughout the lecture he describes this Global Network. He thinks it's a good idea. After all, he says, Al Qaida is doing it and so are the South American Drug Kartels so why shouldn't we? In this Network, it doesn't matter which denomination your church is. It can be a Baptist Church, or a Roman Catholic Church, or any Church. Doctrine is also of no importance to Rick Warren. He calls it a minor issue. The Bible says, that in the end people will not endure sound doctrine, but gather themselves teachers who will cater to their itchy ears. And here comes Rick Warren, trying to unify all the churches into a Purpose Driven Network, claiming how doctrine is of no importance. Telling us how this very same Network will bring about the establishment of the Biblical prophesies concerning the comming Kingdom of God, which will be established by Jesus Christ Personally. The Same Jesus Christ Who will Personally wipe away the so-called Global Giants. It is clear, how Rick Warren's Global PEACE Plan, his New Reformation, is an attempt to create a One World Church ("world class church"). A Global Network of Purpose Driven Churches! Rick Warren claims that the Global PEACE can only be brought into existance by his Network of Purpose Driven Churches. A network of churches who have all gone though the "New Reformation". "The reason why I feel confident about fighting the global giants is we're not doing it on our own power. Governments don't have God's power. Non-government organizations don't have God's power. The power of God is granted to the church. We have miracle, wonder working power. That is a power that nobody else has. So we are the only ones qualified to take on the goliaths that everyone else is afraid and has been unable to resolve." The Kingdom of God will not be established by a Global Peace Plan, not by a New Reformation, not by a Global Network of Purpose Driven Churches. The Kingdom of God will be established by Jesus Christ Personally! The Bible speaks about the Global PEACE Plan, too. We know, how Babylon is creating a New World Order, based on a unification of all mankind under the leadership of Lucifer or Satan. This will be done by the Antichrist. There will be someone who comes in the Name of Jesus Christ, claiming that he is "God". He will claim World Peace. Rick Warren's PEACE Plan perfectly fits into the scenario of the Antichrist. When the Purpose Driven Network comes into fullfillment, there will be an appearant peace. The so-called Gospel will be preached "globally". This will bring about the second comming of Christ, according to Rick Warren. So with his PLAN, people get ready to accept the Antichrist as the second comming of Christ! Does Rick Warren's Global PEACE Plan come anywhere close to such a thing? As a matter of fact, it does. "This summer we're going to begin testing it in the first national model. We've been looking for a nation, a single nation where we would get and together they would say, "Let's be a model of the first Purpose Driven nation."" Yes, you've read that right. It's not enough to have a Purpose Driven Life in a Purpose Driven Church, we also need a Purpose Driven Nation! As we see, Rick Warren is looking to get "the cooperation of the government and the businesses and the churches" in order to make his plan working. Therefore he needs to "test" it. But how can something which supposedly come from God, in order to prepare the world for His second Comming, need testing? How can something which supposedly come from Jesus Christ, in order to prepare the world for His second Comming, need the coorperation of governments and business? The Bible warns us for an unholy alliance of state, business and even religion just prior to the second Comming of Jesus Christ. In fact the Bible tells us that this is all part of a PLAN called "The Mystery Of Iniquity". It's the Plan to create a One World System, which will be ruled by Lucifer or Satan himself! The CRC has reported before, how the American Televangelists are targeting at Africa. Where Babylon has robbed this continent before of it's inhabitants in order to build the Great Cities of Babylon in the so-called New World, she keeps targeting at this land of Creation. 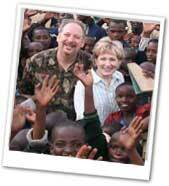 Rick Warren needed a test ground for his Global PEACE Plan, and he "found" it in Africa as well. Rwanda has become the first nation to get the title "Purpose Driven Nation". "I want you all to know that we want to work with you, Saddleback Church, and with all of the Purpose Driven network of churches to be the first national model of the P.E.A.C.E. Plan. Rwanda is interested in forging business relationships with people. We'd be more than happy to let you know the investing opportunities which are available." The first Purpose Driven Nation? Yes. In his speech, Rick Warren boasts how presidents of 30 different countries have all asked for an autographed copy of his book "The Purpose Driven Life". A Global Network of Purpose Driven Churches, a Global Network of Purpose Driven Nations. Presented as a move from God, but in reality a programm which has to be "tested". Does the Bible tell us about a Global Network of Purpose Driven Churches and even nations? As a matter of fact, yes. Today, we know it under the name Globalism or Globalization. Should it therefore surprise us that Rick Warren is even invited to speak in front of such Globalist organizations as the CFR and the UN? Should it surprise us that he has to compare his second reformation with the bloody deeds of Lenin and even Hitler? "In 1917 Lenin said, Give me 100 committed men and I will change the world. He nearly did. In 1939 a group of young men and women in brown shirts filled a stadium in Munich, Germany for a fanatical dictator, a madman, with a mustache named Adolph Hitler. In that stadium they formed with their bodies a sign that said, "Hitler, we are yours!" And they nearly took the world. When I see things like that I think, "What would happen if Christians, what would happen if just the Christians gathered here on the Saddleback campus today would say with our lives, "Jesus we are Yours!" What kind of spiritual revival would we see in our world? What kind of reformation, great-awakening would we see in our nations? Jesus, we are yours!" Which "Jesus" does Rick Warren spak of? As we see, it is a completely different Jesus than the One in the Bible. Warren's "Jesus" needs manmade organizations and plans which have to be tested, in order to make a global unity. Warren's Jesus wants people to create Heaven on Earth after which he will come to rule over that. The Biblical Jesus Christ will come Personally. He will Personally wipe away the so-called Global Giants. He won't test it out on one nation first and all of that. Jesus Christ will come, and prior to His Comming there will not be Global Peace. Rick Warren's Jesus, my dear reader, is none other then Lucifer dressing himself up as Jesus Christ. Whether he knows it or not, Warren is transforming the system of denominations we mistakenly call "Christianity" to fit in the New World Order.